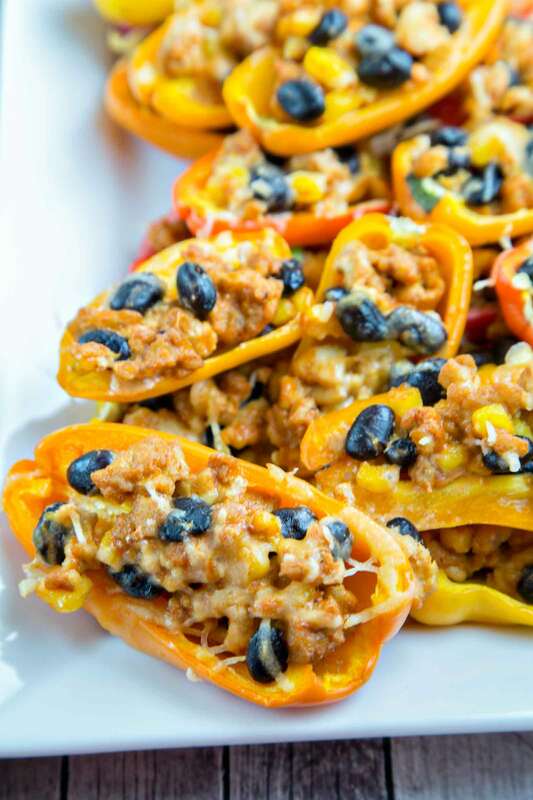 Filled with taco meat, black beans, corn, and cheese, these taco stuffed mini peppers are a perfect gluten-free bite-size party snack. This weekend is my 12th annual Chrismukkah celebration. As you can probably imagine, things have certainly evolved since we first started hosting these in 2005. I was fresh out of college and a first year grad student for our first Chrismukkah party. It basically consisted of friends, cheep beer, cheep vodka, and some snacks from the grocery store. Fast forward more than a decade and we — and our parties — have grown up just a tad. We now fill our home with 60+ friends from near and far and enjoy delicious food, quality beverages, and have a great time. It goes without saying that hosting this many people requires a lot of food, and isn’t exactly inexpensive. Not to mention that last year was our first year hosting with a baby. It was… hectic. I failed to think about how much time is actually occupied by said baby and the whole day was rushed, stressful, and chaotic, trying to prepare food for everyone with an 8 month old on my back. This year, we’re dialing it back just a little, and doing as much prep as we can ahead of time. 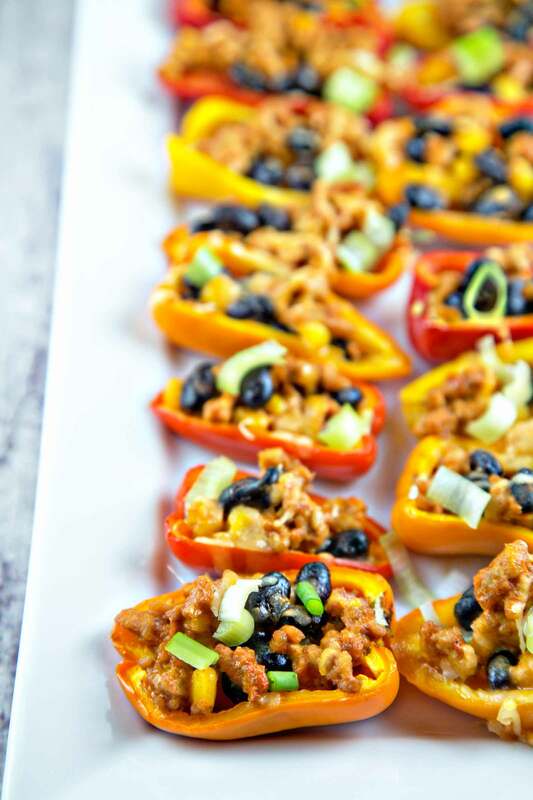 Like these taco stuffed mini peppers! 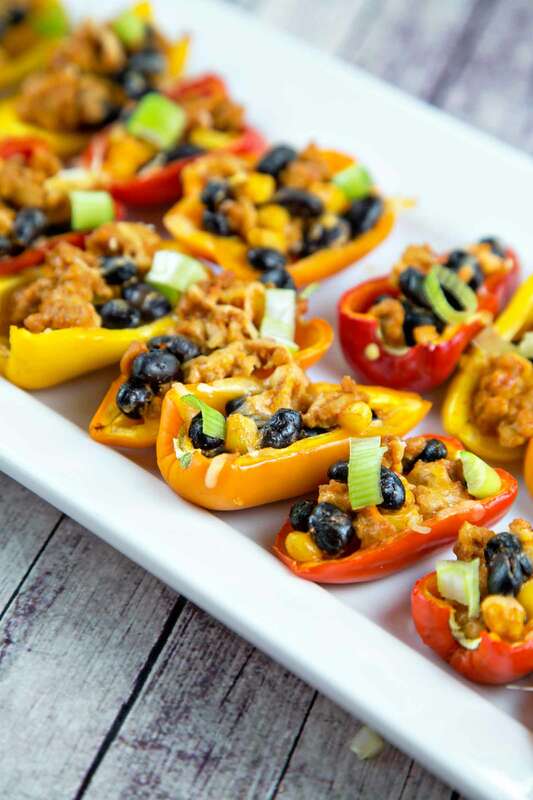 Taco Stuffed Mini Peppers are a perfect party snack. It’s easy to make a huge batch. They’re bite size and you can eat them with your fingers — both essential requirements for good party food. They’re gluten free, which is great if you have gluten sensitive guests (which we do). 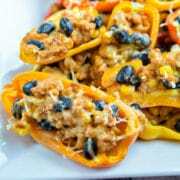 The taco stuffed mini peppers are quick and easy enough that kids can make them. And you can find the peppers year round, which means this is a great choice for holiday parties, summer get togethers, or Super Bowl parties! I made mine with ground chicken, but you can absolutely substitute in ground beef or veggie crumbles to make a vegetarian version. Add in some black beans (remember what I said about my little guy’s black bean obsession?) and frozen corn and top with shredded cheese. I made my own taco seasoning for this, but you can make it even easier and substitute in a taco seasoning packet. Pop them in the oven for a few minutes, and that’s it. Easy-peasy. A great party appetizer or family dinner. 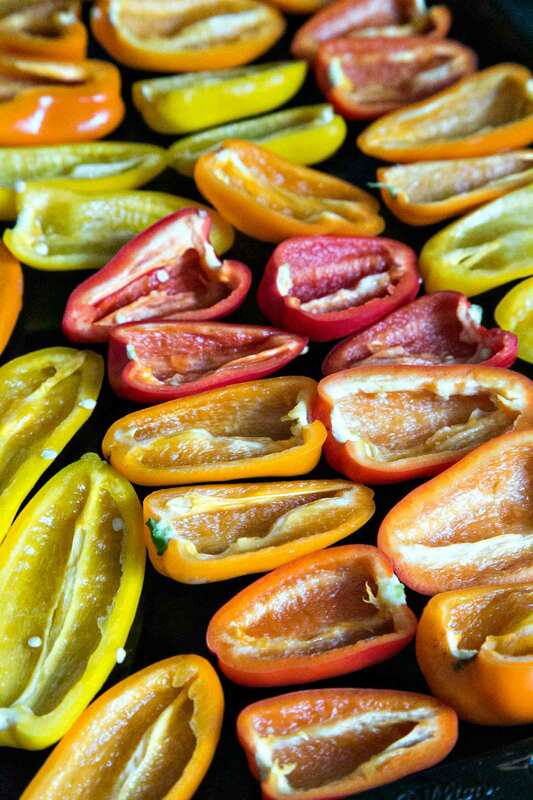 Halve each of the mini-peppers lengthwise. Scoop out the seeds and membranes. In a large skillet, cook the ground chicken over medium-high heat until browned and cooked through. Stir in all the spices and water. Cook over medium heat an additional 5 minutes, stirring occasionally, until mixture has thickened. Stir in the black beans and corn. Line cut peppers along a baking sheet. Fill each pepper with 1-2 tablespoons of the taco mixture and bake for 15 minutes, until peppers are soft. Remove baking sheet from the oven. Sprinkle shredded cheese over the peppers; return to the oven for 2-3 minutes, until cheese is melted. 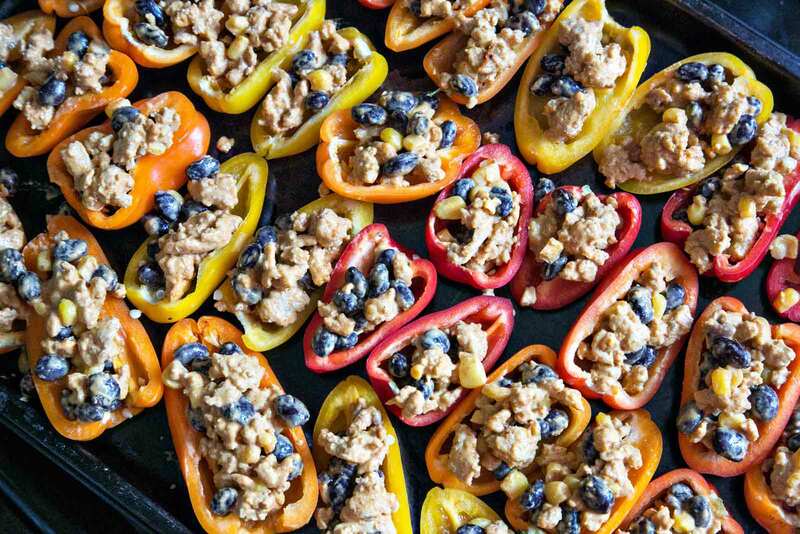 Peppers can be assembled up to a day ahead of time and baked right before eating.